Handcrafted in Nicaragua, Mi Amor exudes decadent notes of dark cocoa, crisp spice and rich espresso. Mi Amor appoints beautiful Maduro wrappers grown in San Andrés to envelop a mosaic of medium- to full-bodied, aged Nicaraguan tobaccos. The Mi Amor Belicoso was just named #13 Cigar of the Year 2016 by Cigar Aficionado. Awesome! Years ago, before the communist revolution that led to the United States cutting all ties with Cuba, there was a brand there known as La Aroma De Cuba, and they were very well received. Ashton cigars greatly desired to be able to revive the name, and with the help of one of the great names in cigars, they have done just that. 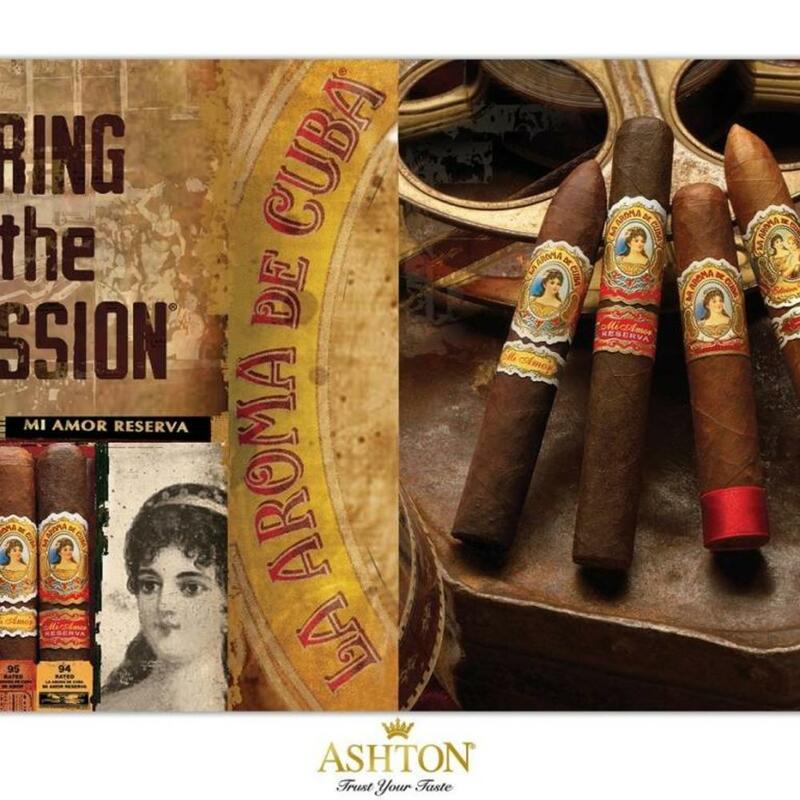 Ashton approached Don Pepin Garcia to look into reviving the La Aroma line, and one of the lines that came out of it was the Mi Amor line of cigars. The band says La Aroma De Cuba, with a smaller band that says ‘Mi Amor’, translating roughly into ‘the smell of Cuba, My Love’. A darker cigar, it is intriguing, and the beautiful woman on the band probably doesn’t hurt its chances either. But what of the substance of the cigar? Well, the Mi Amor line of cigars begins with tobacco from Nicaragua, beautifully aged to bring out its flavor. This beautiful tobacco, the filler and the binder, is then wrapped in Maduro wrappers grown in San Andres, giving it a slightly oily feel and a beautiful and dark look to it. End this with a gentle box press, and you have the Mi Amor Belicoso line. When first your smoke the cigar, you will be shocked that so small a package can contain so much flavor. Dark chocolate, espresso, and just a hint of spice come together to provide you with a full-flavored experience that you will be glad you tried, even if only once, and a cigar that you will want to smoke again and again. A great cigar for after dessert, or for a calming smoke at the end of a day, well worth trying.